I have this deeply-held belief that indoors is just for those times when it’s not possible – or, at least, terribly inconvenient – to be outside. As often as possible, you’ll find me out camping, hiking, foraging, seeking photo opportunities, gold prospecting or anything else I can dream up in the Wyoming wilderness. For most of my life, I’ve had a trusty hound at my heels throughout all these adventures. In fact, I’d go so far as to say that these dogs would have been deeply offended if I had left them at home. By “Wyoming wilderness,” it’s important to note that I mean high altitudes, steep inclines and ever-changing conditions that make hiking challenging. Even supplies for a simple day trip – plus emergency supplies – take an appreciable amount of space and weight. That’s where the Outward Hound dog backpack comes in handy. It gives my dog a job, and also lets him haul his own food, water, dishes and first aid kit whenever we go anywhere. 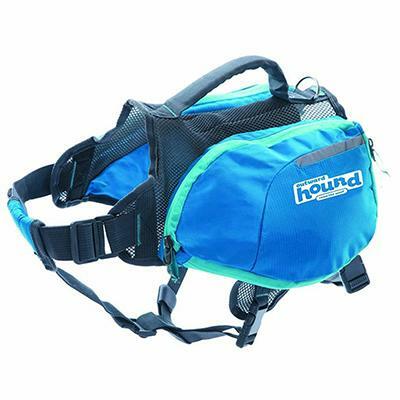 This backpack came as a gift, and is my second Outward Hound product – the first being an Outward Hound travel bowl, which I mention because the two make an excellent pair for long hikes. Collapsed into its small empty size, the bowl barely takes any space inside the backpack. Both items show off the consistent high quality one can expect from the Outward Hound brand, which is always important – but perhaps a bit more important when you’re talking about potentially being out in the middle of nowhere when a seam or buckle gives out. Sturdy, waterproofed nylon make up this backpack, which fits comfortably over my dog’s back. It has roomy pouches on either side in which to carry supplies. The straps that hold the backpack in place are wide and easily adjustable to ensure proper fit, and it has quite an adjustable range. I originally had this backpack for my 50-pound Redbone cross; he died of old age after using the backpack for 6 years. The pack fits just as well on my 65-pound Catahoula, even though the latter has a lot more body mass than his predecessor. I usually put a 20-ounce water bottle in each side of the pack, plus the nylon bowl, the dog’s first aid kit and his food. Often, I’ll also add in sunscreen, bug spray and my own first aid kit – the thinking being that if I hurt myself, it’ll be easier to call my dog and get the kit out of a pack in front of me rather than one strapped to my back. While my dogs have always been in great shape and could probably carry more, it’s best to err on the side of caution and keep it light. Before you go backpacking with your dog, it’s also a good idea to let your vet know what you plan to do and ensure your dog is physically sound. Soon after getting the Outward Hound dog backpack, my water-happy dog decided to go for a swim in the river with it. He repeatedly dunked his backpack to about halfway up the “saddle bags,” but his food inside remained dry. My aforementioned Redbone wore this pack for a 5-day hike up and down the local canyon. I watched him closely for signs of stiffness or discomfort throughout, and saw no indication that he was uncomfortable. On our return, I massaged his muscles and checked him over thoroughly for irritation or abrasions from the straps, and found none. While my Catahoula has yet to adventure for that long, he has a thicker coat than a Redbone and – I’d assume – should do even better. In all its years of use (nearly 10 now), this backpack has shown very little sign of wear. It’s very easy to wash with a rinse through warm water. As a general rule, don’t use detergents on anything you wish to keep waterproof; if you must use soap, use either something very mild or something specifically formulated for waterproof outdoor gear. In all, I’d say I definitely got my money’s worth out of this dog backpack – or, would have if it weren’t a gift. I couldn’t be more pleased with it, and will definitely continue buying Outward Hound dog products as needed. They really keep active, outdoorsy people and dogs in mind when they make this stuff, and it really is awesome for a wide range of outdoor recreation needs. To date, this backpack has outlasted one dog and made it to another dog’s fifth birthday – so three years with the second, since he was adopted from the shelter just before his second birthday. While there are a few old scuffs and stains now, it’s still a perfectly sound pack despite persistent use for 4-6 months out of every year. I can’t compare it to other brands because, frankly, I’ve never needed to try out other brands. Absolute top stars for this sturdy piece of work.